eSports is a growth industry. So much so that Chinese internet giant Tencent plans to invest $14.6 billion into its country’s presence in the next five years. That will no doubt trigger other massive investment from other global entities. For the average human with kids and a mortgage, what is it like at a massive event like EVO? 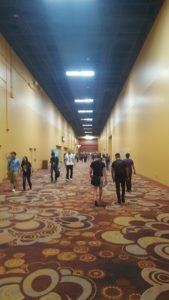 This hallway at Mandalay Bay Hotel and Casino leads to the events center. Yes. 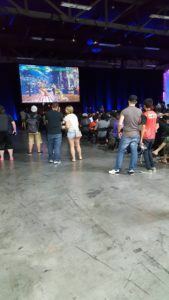 EVO is large enough to occupy a full room in the events center. Event organizers expected 20,000 people to show up just for the weekend. That includes players, media, sponsors, artists, fans, and all product offerings. Before I could enter Bayside E in the events center, this young man had to verify my media credentials. (Read: check to see if I had the right piece of plastic around my neck). Is that tie really necessary? Yes. Yes it is. The wall of sound and color hit me as soon as I entered. Of course the merch table is the first thing anyone sees. Why pay for advertising when you can get someone to pay you to advertise for you. I checked out the merchandise, but I couldn’t afford a $30 hat or $60 shirt. Writing doesn’t pay that well yet. There is the indie developer area full of well-designed games from talented studios and people who just don’t have the distribution of the major players. Then there are the reasons people really show up for this. There are seven different fighting games featured here. Each has its pool round where players pay $75 to enter and play against others. Losers try to win their money back at craps before staying up late in their hotel room pondering their existence before getting back to work at being a better player. Daigo The Beast in pool play. If you’re famous, like the guy in the foreground with the black shirt and headphones, people crowd around to watch. This is Daigo. ESPN, Vice, and other major media outlets spend their valuable bandwidth following these stars. I realize that doesn’t make sense to the average human, but it’s true. ESPN has a large portion of their website devoted to quality eSports coverage. Yes. People actually sit an watch people play video games. It’s a thing now. If you’re good enough, you get to play on stage on the big screen with all the lights and eyes that go along with it. This is Infiniti. 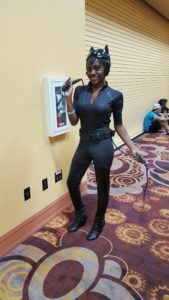 She streams Injustice 2, dresses like Catwoman, and kicks tail like her, too. 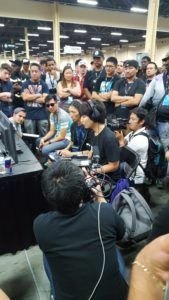 More than that, EVO is about bringing people together under the common banner of video games. This is what kids are doing now and major companies are catching on. Amazon bought Twitch because they see this coming. There’s growth, opportunity, and the next generation of athlete right here in Vegas. 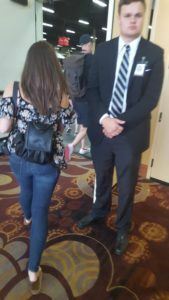 I got to meet a few of them. They are real people like everyone else. They just do something better than the rest of us mortals, and that’s why they are loved. And why people travel from all over the global to meet people they only know by a gamer tag just to share their love of the game.